From the beginning of polar summer in Antarctica scientists are going to start drills which will lift the ice which wasn’t seeing the sun already one and a half million years to light. Having analysed its structure and properties, scientists expect to understand better the nature of change of Ice Ages and warming. About one million years ago Ice Ages and warming on Earth began to replace each other more often than earlier: until the end of a pleistocene era the climate changed each 400 000 years, and then — each 100 000 years. To understand how there was this shift of frequency, scientists of the whole world want to catch in the laboratories that the little that remained invariable on Earth since this far time. Namely — ice of Antarctica, more than one million years not seeing the sun. The most ancient ice of Antarctica is at a depth more than 3000 meters, and his age makes 1 500 000 years. 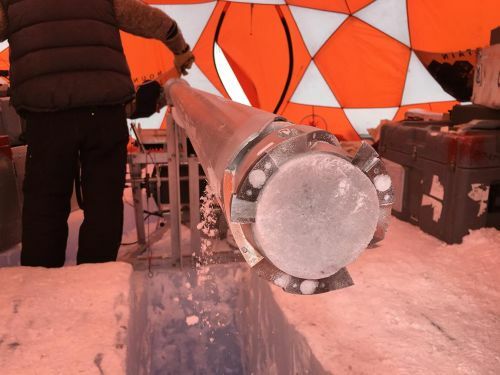 Still 800 000-year core which have received within the European EPICA project 10 years ago remains the most ancient ice core (a cylindrical piece of ice which is taken a drill) which managed to be taken. The European glaciologists remain the main enthusiasts of deep drilling in Antarctica also now. At the end of November when the first real frosts have come to Moscow, in Antarctica the summer begins. From the beginning of polar summer the British researchers prepare the car for high-speed drilling of RAID. For a week of work the car has to fall by 600 meters (for comparison: the EPICA project needed 5 years to get on depth of 3,4 km). 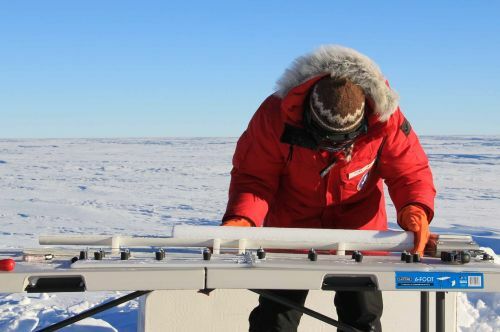 Instead of getting cores from depth, RAID will collect only small fragments and at the same time to carry out the isotope analysis and to take ice temperature. The French scientists have on call other tool — the probe SUBGLACIOR which is ready to drill 3 kilometers of ice for one summer. He, as well as the British drill, isn’t able to get big samples of ice, but analyzes everything around himself in the course of drilling. And here the American RAID tool is able to take long cylinders of ice from huge depth. 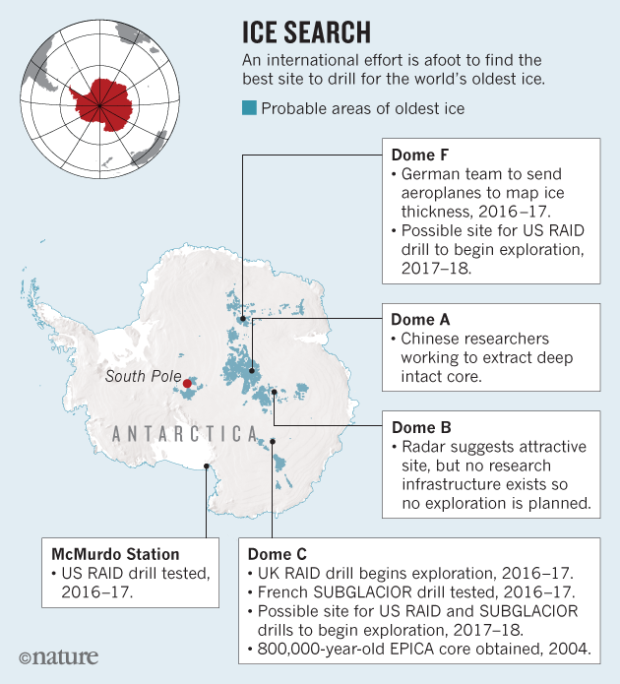 Next Antarctic summer by means of the American drill scientists plan to bring to the surface the most ancient ice on Earth. So far the staff of the Antarctic stations is busy with search of the ideal place for drilling. The cost of this work is measured by tens of millions of dollars therefore it is better to be convinced in advance that in the chosen place ice isn’t melted by continental geothermal processes. The European scientists drilled around the Dome of C — in the same place where participants of the EPUICA project worked. But it not the only place in Antarctica where it is possible to reach the most ancient ice massifs. The Chinese scientists by means of usual (not high-speed) boring installations investigate the Dome And, has to pass test of the American installation near the polar station of Makmerdo. Besides, the German polar explorers investigate by means of radars F Dome located on Queen Maud land where thickness of ice doesn’t concede to the Dome of C now. Ice searches by age 1,5 million years will begin not earlier, than researchers will choose the point, most suitable for drilling.